These parts are for the Align T-REX 600E and stretched variants of it. This section is old, but I still have a few of these parts if anyone needs them. 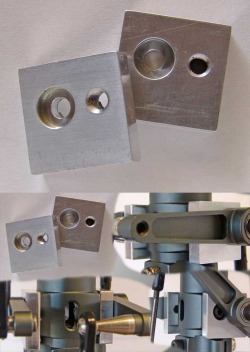 These custom made mounts are milled from solid 6061-T6 Aluminum. They are the result of many hours of analysis using AutoCAD to determine a geometrically pure and relatively inexpensive way to build a flybarless head using mostly stock and upgrade Align parts. They allow you to mount a pair of modified Align washout control arms (see below) to the head and get near perfect geometry for a flybarless configuration using stock length linkages. This also allows the use of stock metal Align blade grips without turning them upside down. They attach with a single M3 button head bolt and wedge snugly against the bottom of the mount to prevent rotation. I recommend securing them with a generous amount of locktite on the backside to ensure they hold the exactly correct position against the head block. Included are the two square aluminum mounting blocks, two spacer washers and two M3 button head bolts - everything you need to install them except locktite. Available for $19.99 + FREE shipping to US 48 states. This is the extra long CF boom to allow you to stretch a Trex 600 to a 700 and run up to 710mm main blades. Note that the picture is of the stock Align boom, but this longer boom is completely identical except that it is longer and does not say "Align Helicopter" on it. You will also need a pair of H60124 Torque Tube Bearings, and a Raptor PV0194 drive shaft to complete the mod (and, of course, a full torque tube drive). The price below is just for the long CF boom. Available for $59.99 + FREE shipping to US 48 states. 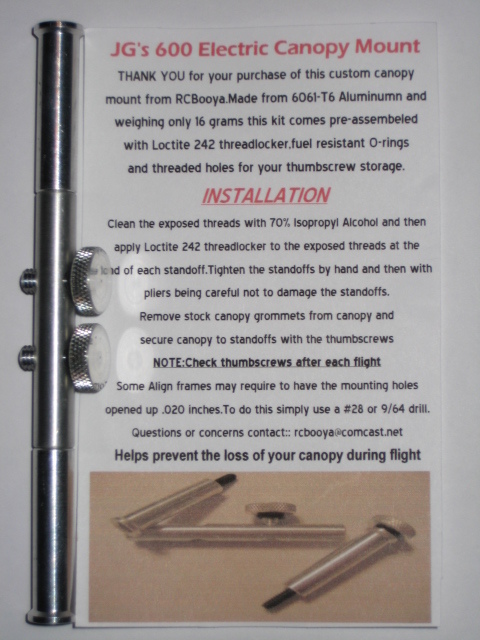 Made from 6061-T6 Aluminum these are designed to fit between the frames of your Align 600 Electric Helicopter to give added support where needed. These are very handy for many things including the 700 stretch above. Kit includes 2-frame supports and 2-M3x.05x10mm socket head cap screws. Available for $9.99 + FREE shipping to US 48 states. Made from 6061-T6 Aluminum and weighing in at 16 grams, these mounts help hold your canopy on during EXTREME 3D manuvers. 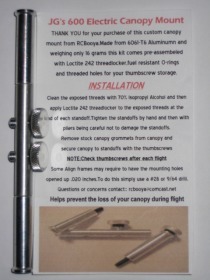 Also increases the rigidity of your frames and drastically reduces the possibility of breaking your frames or canopy mounts in a crash. Each kit comes pre-assembeled with Loctite 242 blue threadlocker, fuel resistant o-rings, and threaded holes for thumbscrew storage. Fits the Align 600 Electric Helicopter.